Are you like me? 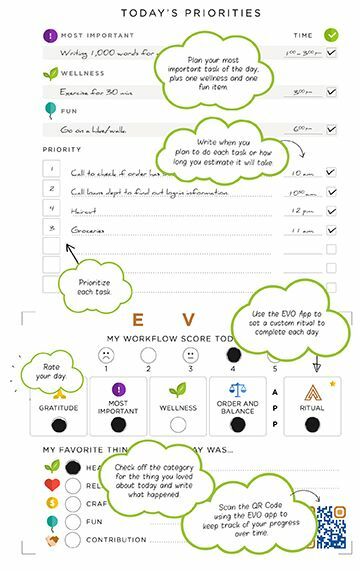 Do you enjoy the feeling when your schedule (and LIFE) is organized? Do you hate forgetting appointments, parties and plans? Do you like WRITING in a BOOK once in a while? If so, chances are you already have a planner. There are SO MANY kinds of planners. It’s very overwhelming. There’s a Bullet Journal craze going on, and I do like to explore my artsy side, so this past year I’ve been using what’s called the Simple Elephant planner. This planner has absolutely been meeting my needs – it is undated, has monthly and weekly spreads, goal setting pages, and a big section of blank note pages where I can do my own thing. I liked this format because I wanted to try to make a bullet journal, without the additional work of writing out a monthly spread myself, and setting up layouts each week. I don’t quite have time for that! I’ve been using the blank note pages whenever I have a Bullet Journal (#bujo for short) idea, and it is a lot of fun. Stickii Club: This club has more of an Asian flair, with a lot of imported stickers from Japan and Korea. Each month the stickers are shipped in an adorable A5 organizer binder page, and includes a binder ring, a funky shaped paperclip that matches the month’s theme, a fun stationery sample, and several sheets of stickers. You can buy previous month packs on their website, so if you don’t want to commit to a monthly club, you can just buy what you like! Check em out! Pipsticks Club: This club feels like it’s marketed to women who grew up collecting stickers in the 80’s and 90’s, and now want to get in touch with their childhood hobbies, or share their love of stickers with their kids. (They offer a kids sticker club too!) There are no monthly themes with this club, but every month you get several sheets of fun stickers with funky designs and characters, and they always throw in a blank postcard to decorate. One time, I got a giant roller skate sticker too! I’d like to add that both of these sticker clubs have phenomenal customer service, so don’t be shy! If you had a sticker book in elementary school, you might understand what the RUSH of excitement feels like when I see a monthly sticker pack waiting for me! They are pretty affordable too. Me likey. 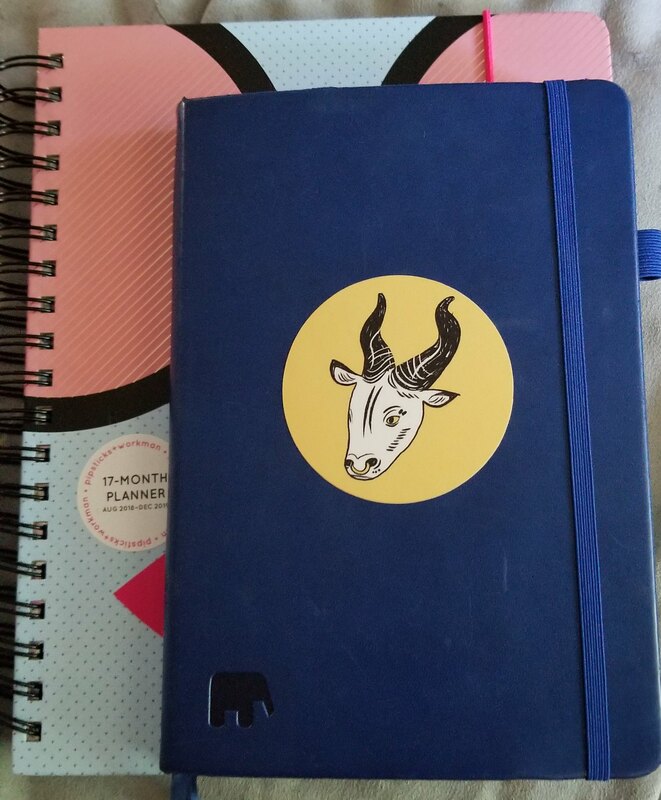 So I’ve been having lots of fun with my Simple Elephant planner, making bujo pages, writing in my events and appointments and keeping my life organized. It’s definitely fun to design a custom bujo page, but sometimes I feel like it’s a bit too much work. I don’t do it enough, and lots of the blank note pages in the back section are going to waste. This has lead me to search for a new planner that might fit ALL of my needs. 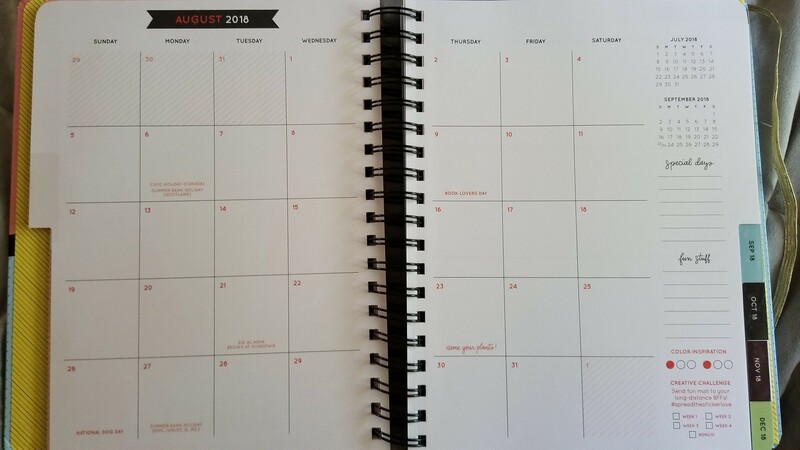 I’ve learned that during the summer, most of the planners available are Academic Calendars, meaning they are from July – June of next year. I don’t want that. Amazon was proving to not be helpful in my research. Last year, I was using the Passion Planner. While it is AWESOME in terms of setting goals and goal tracking, I didn’t like it. My problem was with the weekly spread – it was too regimented by hour, and I don’t have enough meetings and appointments in my day to day that requires such an intense spread. If you DO have a crazy schedule that you must track by the hour, then absolutely give this planner a strong consideration. It’s definitely great. I think it encourages a lot of creativity while also engaging the right brain’s love for organization. But it just wasn’t for me and decided to keep searching. Well, I was still at square one in my search for a new planner. I didn’t want to spend a ton of money on a planner that doesn’t function the way that I want it to. I don’t want intensive daily spreads. I want monthly grids, weekly overviews, some space for reflection and goal setting, plus FUN! I need fun. Fun is vital. Remember that sticker club Pipsticks that I mentioned earlier? That company knows all about fun. So much so, that they started sending out emails that they too were selling a planner. I was intrigued! They teamed up with Workman Publishing to create fun planner that is unique and creative. Check out the three designs here! I decided to purchase it because I’m already a happy Pipsticks customer, and I also happened to have a coupon. I decided to get the “This Changes Everything” planner. But when it arrived, I was in a panic… because it was DIFFERENT! After opening the package, I was dismayed that I didn’t look at the dimensions of this planner before ordering. It’s considerably larger than my Simple Elephant. At first I thought this was a MAJOR issue, but the more I’ve been holding it and flipping through the pages, the more I love it. 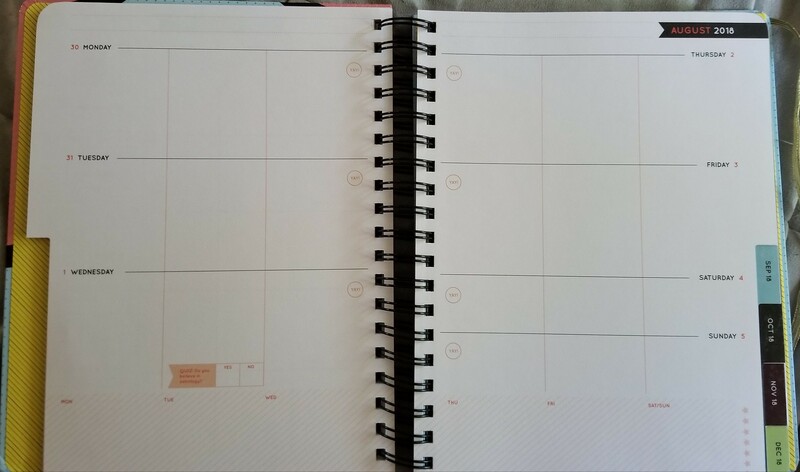 The planner creators really made an effort to create a planner that was fun and functional. Here is the August monthly spread, to give you an idea. There is a little creative challenge in the corner of each month. There’s room for special dates and notes, plus PLENTY of space in each calendar square. There is also plenty of room for STICKERS! Now take a look at the weekly overview. It may be hard to read, but on Wednesday there is a little mini-quiz. I love how the days are split up into sections, so I can separate work and after-work activities. At the bottom there’s space for any big DAY reminders or notations. There is also a little YAY in a circle on each date, this is to be used with the included stickers to indicate if I’ve done something that I’m tracking that day – such as working out, drinking enough water, or whatever my current goal might be. The included sticker pages are really cute too, and are separated by season and have fun stickers that coordinate with the theme and color schemes of the monthly pages in that season. 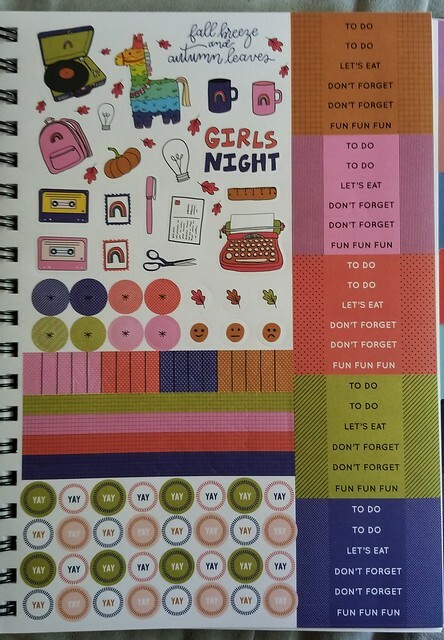 They clearly put a lot of thought and care into this planner. Yes, I wish it was a little bit smaller. But I will embrace this planner, and all the extra space that it allows! One thing I can’t seem to remember (and I am writing this at work so I don’t have it in front of me) is if this planner has blank pages in the back for me to get my bujo on. I want to say yes, but I’ll have to check at home and update later lol! However, even if it doesn’t have blank space, every month has a review page and that’s basically the only thing I’ve been writing in the bujo section of my Simple Planner the past few months anyway. I think once I adjust to this planner I will really love it. Change is good. And as my new planner states, THIS CHANGES EVERYTHING. The end of July is upon us and I will start using this new planner in August! Do you use planners to stay organized, or does Google Cal handle your life? 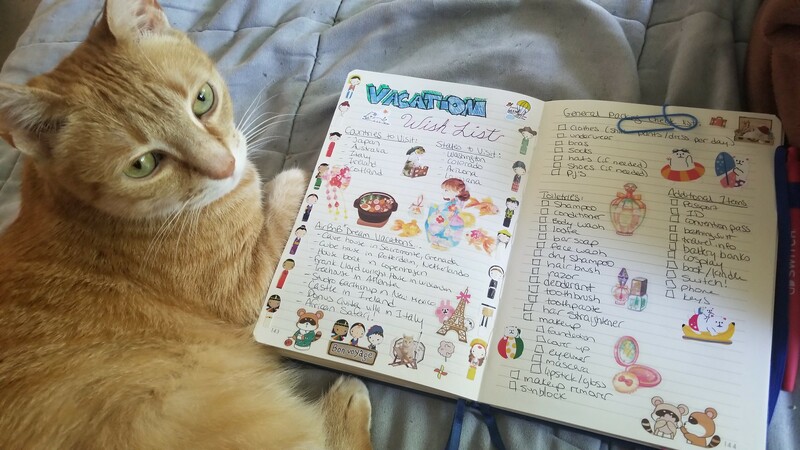 If you like to use a planner, please share what you use! I’m all ears! It’s so much fun to use stickers, right? If you know of any other sticker clubs that are fun, please let me know!